The summer of 2001 was an eventful time for me at work. At that time, I was running the Internet Explorer 6 team, and our big focus was on privacy on the Internet. Just before that, DoubleClick had bought out an offline (old-school) marketing information firm, and the FTC got concerned that they would merge online and offline data – creating master profiles of everything that people did in both worlds. (This was at the time that DoubleClick was the king of ads, before Google took it to all of them/us.) As a result, there was a lot of FTC, state attorney-general and legislative concern about protecting user’s privacy. Turns out that when folks are concerned about Internet privacy, when you are running the browser that has 95% share (ah, the good old days), well, you get to talk to those concerned folks – the FTC, state AGs and the people’s representatives in congress and the senate. As part of my IE gig then, I flew to DC a few times and presented to members of congress as well as the FTC and other NGO-type privacy advocates. I even got to testify in front of congress on this point. Now, that was fun! an answer buried in the answer, but it is not like upfront. It is kind of diplomatic talk. I was telling them how IE was dealing with cookies in our upcoming v6 product. I was also telling them about P3P and how we were using that to help users. During that summer, I got to meet with a wide range of folks in congress – John Kerry, Ted Stephens, George Allen, John McCain and Joe Biden. No kidding. During the time that I was going back and forth, control of the Senate changed from Republican to Democrat. The interesting thing was that I met with Ted Stevens from Alaska when he was the Senate Appropriations* Chairman – and we met in the room in his office -actually in the Capitol building where the Senate Appropriations Committee met. It was pretty imposing. (NB – most people in congress have their offices in either of the office buildings *next to* the Capitol. Only the most senior Senators and Congresspeople (generally of the party in control) have offices actually in the Capitol.) On a later trip, when control had shifted, he was in a way smaller office, which was kind of like a little hallway actually, in one of the senate office buildings. He did not appear pleased by this turn of events. After doing about twenty of these presentations, with me, a rep from the Microsoft DC office, and someone from our PR group, we had gotten into the flow of it. We knew how to do the presentations, we knew what questions to expect, and we knew when to cut it short and stick to the shiny demos. One of the last people we had the opportunity to present to was Joe Biden (D), from the great state of Delaware (Delawarians, or Delawareites?). I love to rag on Delaware, since they are only marginally bigger than the state of my youth – Little Rhody. It turns out that the Microsoft DC guy, who was just fantastic (and I state this up front, because, well, this story doesn’t turn out so well for him – but, I still like him a lot) – he knew all of the staffers, knew many of the members of Congress, and was an overall great guy to work with – and, Joe Biden was his Numero Uno favorite member of congress. Now, we had this whole deal carefully scripted – when I would talk, when he would talk, when we’d do demos, when we’d do slides – it was tight. Now, he wanted to do the whole deal for his idol. So, we go in to meet Biden, and Biden just looks feisty. He’s buzzing with energy. Maybe he needs less coffee, maybe more – who knows! But, he’s en fuego. My colleague, who I will call “Ringo” for sake of argument, starts off. 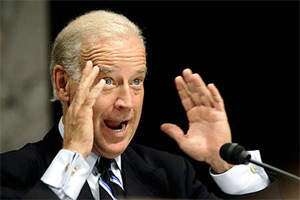 Biden starts peppering him with questions. Questions that we have not heard. Questions that don’t really make sense. Ringo is flustered, and Ringo doesn’t know what to do. I don’t want to rain on Ringo’s parade, so I let it go. I don’t want to jump in. You can pull it out Ringo! I did… Biden had his pound of flesh, and we went on to our next appointment, all smiles, except for Ringo…..
*9/5 – Correction, Senator Stevens was the head of the Appropriations not Finance Committee, thanks to SAC for the edit.